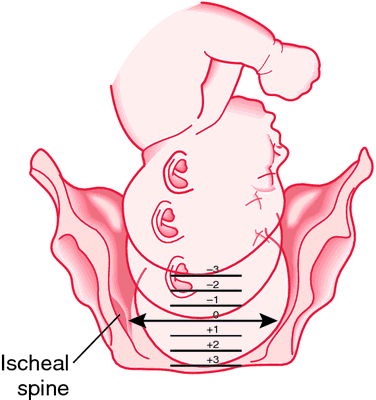 the location of the presenting part of the fetus in the birth canal, designated as −5 to −1 according to the number of centimeters the part is above an imaginary plane passing through the ischial spines, 0 when at the plane, and +1 to +5 according to the number of centimeters the part is below the plane. Station of the fetus. From McKinney et al. 2000. The degree of descent of the presenting part of the fetus through the maternal pelvis, as measured in relation to the ischial spines of the maternal pelvis. 1. a position or location. 2. the location of the presenting part of the fetus in the birth canal, designated as −5 to −1 according to the number of centimeters the part is above an imaginary plane passing through the ischial spines, 0 when at the plane, and +1 to +5 according to the number of centimeters the part is below the plane. the level of the biparietal plane of the fetal head relative to the level of the ischial spines of the maternal pelvis. An imaginary plane at the level of the spines is designated "zero station." Higher and lower stations are numbered at intervals of 1 cm and labeled as minus above and plus below. For example, "station minus three" is 3 cm above the spines, and "station plus two" is 2 cm below the spines. In breech presentation, the bitrochanteric diameter of the breech is used to determine station. See also dilation, effacement, labor.